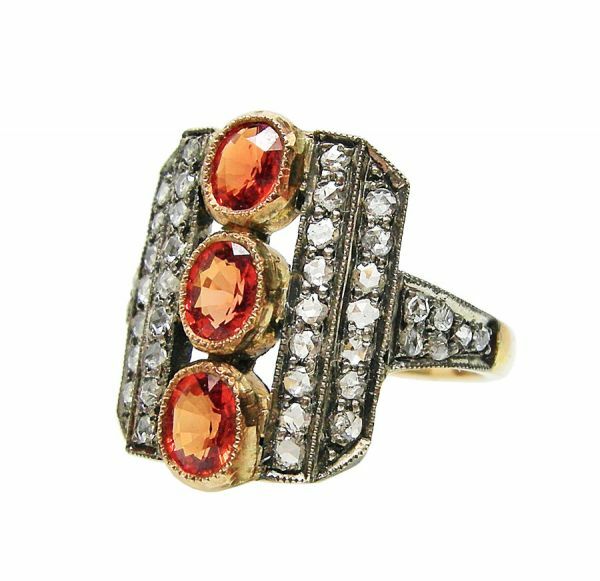 A stunning Art Deco inspired 18kt yellow gold and silver top mill grain ring featuring 3 oval faceted cut deep intense orange sapphires, est. 1.34ct and 44 rose cut diamonds,est. 0.30ct (clarity:SI-I1 & I-J colour). The top of the ring is approx 0.75 inches (1.91cm) long x 5/8 inches (1.59cm) wide.